Published in 1914, Rosshalde is Hermann Hesse’s fourth novel. It tells the story of a failed marriage and the disillusionment of a painter. In many ways it’s a continuation of Gertrude. Both novels are autobiographical, Rosshalde even more so than Gertude. Hesse often tried to make sense of his own life in writing his books, that’s why critics call many of his narrators alter egos. Johann Veraguth, the main character of Rosshalde, is a painter who is entirely dedicated to his art. The only love in his life is the love for his second son Pierre. He bought the estate Rosshalde many years ago when there was still hope for his marriage. At the beginning of the novel, he returns home one night on his own and looks at the dark house. He has moved out a long time ago and lives in his artist’s studio. He gets up very early every morning, paints until noon, then takes lunch with his wife and son and later paints again until the evening. He’s a rich and famous painter, lives a life of ease, surrounded by beautiful things, he even has servants but he’s very lonely. His wife is hard and distant and has never really understood how he could be so absorbed by his art. His first-born hates him and had to be sent to a boarding school. His best friend travels the world and only rarely returns to Europe. The only joy in his life is his little boy. If his wife allowed him to keep the boy, he would have divorced her a long time ago. Veraguth is unhappy but he doesn’t even realize it. He’s a bit like a well-oiled machine. He produces one painting after the other, follows a strict routine. All this changes when his old friend pays him a visit. He’s shocked when he sees how Veraguth lives and tells him he has to leave. He cannot go on living in such loveless isolation. But Veraguth cannot make up his mind. He’s too attached to his boy. Nonetheless, he has to admit that his friend is right and before he leaves again, he tells him he might follow him to India and spend a couple of months with him. I had very mixed feelings while reading this. I didn’t like the beginning all that much but from the middle on, I really started to love this book. I finished it a week ago and it’s still constantly on my mind. There’s so much to like here. But there’s also a lot that I didn’t like. I really loved the descriptions and being in Veraguth’s head when he contemplated nature, his garden, his art. Those passages reminded me of Mercè Rodoreda’s novel Jardí vora el mar. In both books, a solitary man lives in a small house, surrounded by a huge garden and follows the life that is led in the estate nearby. But these passages also reminded me of Virginia Woolf’s The Voyage Out. The end of the novel has affected me quite a bit. I can’t really say anything without spoiling it – just this much – it’s very similar to The Voyage Out as well. I also liked how Hesse depicted Veraguth. The man’s so absorbed by his work, so self-centered, that he doesn’t even notice when his kid needs him, although the boy is the only really good thing in his life. Some of these scenes were written from the small boy’s point of view and were very sad. What I didn’t like is the idea behind the novel. As I said earlier, it’s autobiographical and closely mirror’s Hesse and his wife’s marriage. From his biography I know that Hesse believed that artists – writers, painters, musicians – should never get married and live conventional lives. His own wife didn’t really understand him and having to provide for her and his three kids took its toll on him. Unfortunately, his views are so dated. His views on marriage, artists, and especially his views on gender. When you read about his views, it’s clear that the artist is always a man and the woman, who wants children and is dependent on him financially, will become a burden. Even so, Hesse thinks that the true failure of the marriage comes from the fact that an artist makes a poor companion. He’s too narcissistic, to self-absorbed. I couldn’t agree less. I’m sure there are artists like that but there are just as many narcissistic, self-absorbed people who don’t create anything. I’m afraid, it might have been a character trait Hesse struggled with. My problem with it is that he thinks it’s a universal problem, thinks that all artists are like that. And then there’s the language. Hesse’s a very original writer. He creates words, uses new combinations but his German feels very old-fashioned, and his choice of words are at times too emotional, too sentimental. Don’t get me wrong, in spite of these negative aspects, I’m glad I read this and really loved it. But I had to ignore his views on men, women, artists, and marriage and just enjoy the amazing descriptions, the interior life of his protagonist and the terribly tragic story. Rosshalde might be one of the best books for someone who hasn’t read Hesse and is a bit wary of his spirituality. Those who love him, do love him for that, but those who shy away from him or don’t appreciate him, often mention that aspect. Rosshalde isn’t like his later works in that regard. It talks about transcendence of some sort, but it isn’t meant in a religious way. Have you read Rosshalde or any other of Hesse’s books? Which is your favourite? I think I’d like this. I’ll have to see if it’s available in English. I thought that of all those I’ve read so far, you’d like this the most. It is available in English. Great review Caroline! I can’t remember if I’ve read this one, but if I have I’ve forgotten everything about it. I think you’ve picked up the two elements which have been striking me on my readings of Hesse. Certainly, women don’t have an important place in his universe; and the language *is* old fashioned (even in English translation as the versions I’m reading are quite old). The latter doesn’t bother me, and the former I can live with – I’ll simply have to put it into a box labelled “old fashioned view of women” and focus instead on the storytelling, which is wonderful! Thanks, Karen. I don’t think you’d forget it. Not with this ending. It’s so tragic. Luckily, he’s not misogynistic – that would be hard to forgive -, just – yes, old-fashioned. I was wondering about the translations. I guess a newer translation would dust off a few peculiarities without harming the book. Possibly, though I find that as I in a way came of age with a particular era’s writing, I tend to favour it – so I’m probably ok with the old fashioned nature of the translation! I would have to have a look to see what he’s like in translation. Zweig is another German or rather Austrian author who fares much better in English translation. However, they might be newer translations. Interesting to know that this book is autobiographical and a continuation of Gertrude (at least in some sense) – I read Grant’s review of Gertrude at the weekend. I’m new to Hesse, so it’s nice to get a feel for his work via your joint initiative with Karen. I think a lot if what he wrote is autobiographical. Sometimes it’s dangerous to assume that but in his case it’s pretty safe as he wrote about it in his letters and journals. I haven’t read Gertrude, I read about the similarity in his biography. It will be interesting to compare. Great post! An author I have heard of but never read. Maybe now is the time! Thanks, Kaimana. Yes. Maybe you would like his fairy tales. Or Siddhartha. Wonderful review, Caroline. I haven’t read this, but I think I would like it. Will have to adjust to the mores of the times, certainly. I thought it was quite haunting. Dated in places but lovely in many others. Isn’t it odd? 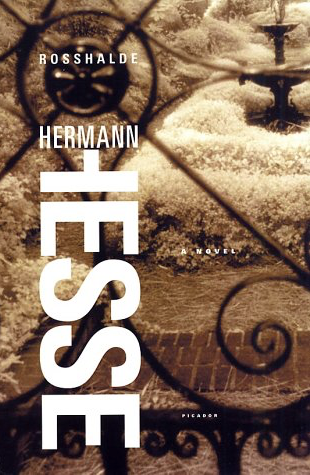 I didn’t even know about this novel by Hesse. I wonder if it’s available in English. But then again, if it’s not, why aren’t all of Hesse’s works translated into English? Now that’s a question. My favorites of his are Steppenwolf and Demian. I adored both of them. I think my next Hesse read will be Narcissus and Goldmund. I’m glad you’ve reviewed this one–a very interesting review. Thank you. You’re lucky. It has been translated. It’s completely overshadowed by his more famous novels but unjustly so. It’s a very fine novel. Thank you. Great review makes me curious and eager to read the book. Thanks, Vicky. let me know what you think of it should you read it. I love the Hesse books that I have read but I have not read this. I agree that as you describe them, some of the views here have been shown as invalid. I think that my favorite Hesse book is Sidarthur. I like Hesse’s brand of secular spiritualism. I too like i^his more spiritual books best. Still, it’s well worth reading. Wonderful review, Caroline. I loved reading about the things that you liked in the book and the things that he didn’t. I always loved Hesse’s depiction of the interior lives of his characters and it looks like this book scores high on that. It is sad that his thoughts on marriage, artists, gender are all dated. And I agree with you – narcissistic, self-centred people are there everywhere, not just in the arts. Thanks for this beautiful review. Thanks, Vishy. I think you’d like this. The passages in which Veraguth is on his own, contemplating nature, painting are wonderful.